Today is the day of our 5th Birthday! Well its be a long yet exciting but creatively bumpy but firm road over the past five years. I've enjoyed every single part of it and I hope my readers you've had too! From starting out sketching to typing up this birthday post its a reflective milestone too. THANK YOU FOR ALL YOUR BIRTHDAY MESSAGES! Jean Joaillerie Jewellery Box: Bonjour Paris! 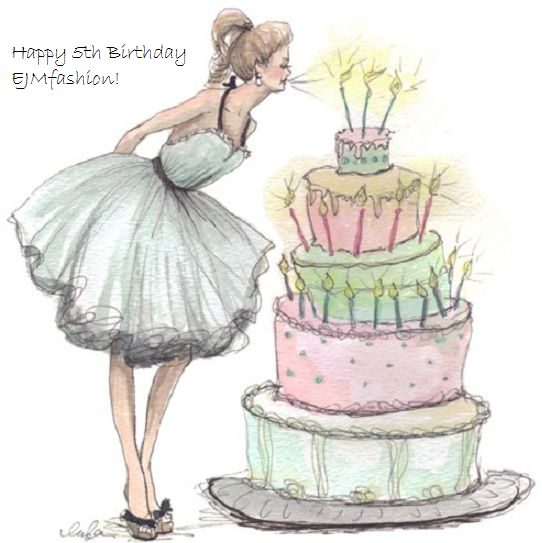 and become apart of this creative yet expressive platform over the past five since EJMfashion launched. I've enjoyed all your comments and emails readers too. regarding the new talent holding every Thursday. Its what I love the most getting people's work noticed in their own industries. Even though twitter is by on the move contact book. I've gained contacts which I would have not believed in getting when I first started out. Its been a long yet bumpy ride over the past five years yet I've learnt a lot from people I've met to working with. Its been an extraordinary yet creative expression of five years being a fashion blogger. over the coming time period. Oh knows what will come next... "